Showing results for tags 'Fw190'. Hello, I present you my last kit, I just love the fw190 but spetially the Dora, for some time i planned this one and it took about 8 months or so. The concept behind this one was to show the Jumo 213E engine, which characterizes the Dora series, viewed from one side and below in such manner that both technical detail and also it's distinctive nose shape could be seen. 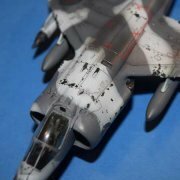 Modifications: it's the 1/48 hobbyboss offering. I used the Aires resine engine and quickboost flaps, among the many modifications where a lot of scratch building, just to mention a few, internal structure of the cowling covers, engine support struts, inner fuselage structure, auxiliary tank, radio and access covers, the cannon bulges , cannons and much more.... The kit was fully rescribbed and fully riveted with rosie, painted with gunze and valllejo acrylics. In full was a very rich experience and the first attempt to superdetail for my part, and i can't wait to tackle another german subject in such depth (the eduard g6 late is winking at me).... in the meanwhile i'm doing a ki 84 Hayate in 48... but it might take a while for that one to reach the skyes over my flat jejeje... hope you ike it. Hey, here I present you my last build: Fw190A-5, Eduard 1/72 ProfiPack. I had added some extras to this build, her corresponding Flaps, some more details in PE, and the engine and fuselage guns, all from the same manufacturer. This is, for now, my very most difficult build because of the tiny of this size. The engine and the guns are so small for my big rude fingers! It was a challenge.... Well, I'm happy with the result. I have had some mistakes at the time to mount the engine, it was a lot of try and failure. The upper cowling cover also is a little bit bent from the correct line. Also there is some silvering in the decals. But it is not bad at all, for my short expertise. I have in my stash 4 more models in this scale, but I think I'm not gonna buy any other more at 1/72 because of mi sight! Revell Fw190R-11 OTB. You only live twice. Hello guys; I recently finished this model. It will be a future part of a Mistel composition: FW190 A8 +TA 154. It's a complicated kit with bad fittings. It's out of box and I used Dousek's riveter. Tamiya's mix were used. Ta154 is on production. Cheers. What is the Fw 190 A-5Y? Hello, this is my last finished model. Because of the university it took me a long time to finish it but I had fun in the process. This Eduard kit is excellent but it requires attention in the assembly because you can have problems of fitting later, even more if you use the aftermarket resin parts. Decals are great and the detailed level is high. I have included: Eduard PH parts to the cockpit and exteriors Eduard Masks Eduard Brassin fuselage guns Terrains Dark Earth from Ak interactive and WWS static grass (4mm and 2mm) for the base It was painted with the K4 paint set 2 for Luftwaffe Aircraft , and weathering and scratches were made with Gray and Blue Camouflage AK paneliner, K4 pigments sets and pencils. It represents the Fw 190A-5 Werk No. 2594 flown by Maj Hermann Graf CO of JGr Ost on Bordeaux, France, Spring 1943. . This is the first job I do in 20 years. I know it has a lot of flaws, but for the time I did not pick up a brush I'm pretty satisfied. He will form part of a diorama along with a Ju 87 R Stule from Revell to represent an aerodrome in the northern Algeria of Afrika corps. I hope you like it. Soon I will upload more photos of the Stuka and the diorama. Good flight!!! I'm about to start building Airfix's 1/24 scale Focke Wulf 190 A5/6, a long cherished dream to build a 1/24 scale aircraft again. This will be only my second aircraft build in this large scale, and the first one was in about 1978 or 1979 when I was either 12 or 13 years old. Hannants lists a number of after market accessories for the Airfix FW190, and I'm sure none of them appeared until decades after the said kit first came out. The kit came out about late seventies or early eighties, but I'm sure the after market stuff manufactured by the likes of Aber, Master and Eduard didn't come out until the 2000s? It's great to have them to spruce up an old kit. I have ordered sets of guns and seatbelts to enhance the FW190, but does anybody know if there are aftermarket exterior panels available, such as those that cover the gun bays and the radio compartment to the rear of the cockpit? Hannants has in stock landing gear by Scale Aircraft Conversions for the Trumpeter FW190D, but does anybody manufacture landing gear for the FW190 A version? The landing gear for the D version is metal, and thus stronger. I've checked Scale Aircraft Conversions' web site but there is no landing gear for the A version. Could this kit also be enhanced with after market ailerons, slats, tailplanes and fin? There is always the possibility of course for the modeller to do scratch building where there are no commercial products available, but I don't think my skills stretch far enough for that. Or put it this way, I don't think I would be able to invest enough time to do it, on top of what could be a lengthy project just by building it OOTB. I would also like to insert the Airfix motor made to go with 1/24 scale aircraft in order to turn the propeller but this item seems to be out of stock everywhere now. If anybody knows where I might obtain one I would be grateful. On the other hand, there are other small motors available that will do just the same. Hey guys, Finished this guy last night. A Focke Wulf 190 D9 of Jagdverband 44, it's iconic striping serves to distinguish the plane by friendly AA gunners as it was employed to cover the Me 262 when it was vulnerable during take off and landing (I think). I am quite happy with it. The kit is very good, nice crisp moulding, standard Tamiya. The plastic is maybe overly soft if I was to be really picky, but good to work with all the same. A small kit, still relatively well detailed for it's size even with everything being on one sprue. Also the decals are pretty thick (All except the crosses on the underside of the wings that are apparently very thin and I wish I had just painted because the white is still a bit visible) I painted the striping on, started with a white base across the whole underside, then with thinly sliced Tamiya tape (using the decals as reference) to mask the white stripes (this plane should be the band's logo). Then with the red, I was careful to under thin the paint for spraying so it came out quite thick and thus didn't run under the tape (It actually worked! I know I was surprised as well) Apart from that it was just a pretty standard little Fw! I recorded the full build of this which will also be posted along with the SU-2 and Norwegian Harrier GR1 that I recently shown on here to my Youtube channel as soon as they're pasted together (MURRODELS) Thanks for reading, what do you's think? Hope you's catch the videos once they're out, cheers! Built as part of the FW190 STGB. Knowing very little about the FW190 or German aircraft in general I found myself doing a little research and was pointed towards the aircraft in the wartime picture being G model rather than A model FW190s. A few very crude modifications then followed with this build which is finished in a faded winter camouflage scheme. I didn't get as much fun out of this build as with most other Matchbox kits for some reason. Maybe this was because the kit was a little tricky to smarten up or maybe it was because I went about building it the wrong way. Either way here it is. I feel I didn't really do a very satisfactory job on this kit but if anyone thinks they would like a go at building one of these then please be aware of the Matchbox group which needs your vote.